Sending your mail with webpost is simple and cheaper than franking or stamps! "Hybrid mail is the future of letter delivery"
Are you tired of waiting for all your invoices to be printed? Are you fed up of the time taken at your franking machine and folder inserter? Do you wish you didn't have to make that daily trip to the post box? Would you like to save money by cancelling your mail collection service? Are you looking for a more cost-effective, time-efficient method of sending mail? Unlike current mail processes Webpost simplifies the mailing process by printing, folding, enveloping and stamping your letters, invoices, statements or other documents before delivering them to the Royal Mail for the final mile delivery. At Webpost, as one of the UK’s leading hybrid mail providers, we have a wealth of experience in the mailing market and are dedicated to bringing our customers hybrid mail solutions that are simple yet effective. Webpost has many customers within the health sector so you can benefit from our compliance with NHS Information Governance, also Public Sector and business with GDPR compliance, which ensures data confidentiality. Here at Webpost, it is our mission to provide our customers with a stress free service. Our innovative mass mailing and hybrid mail software will not only help you cut costs, but will save you valuable time. 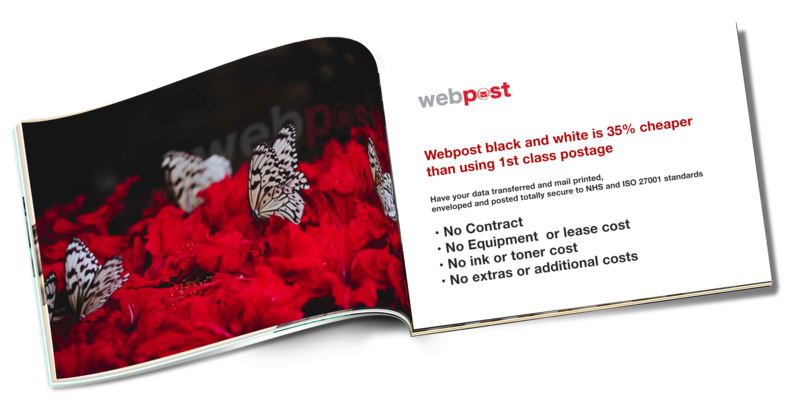 With Webpost, there is no need to spend valuable time printing, packing and posting. Take care of all of your mailing requirements in a couple of simple steps. Print any A4 document from any of your PCs located anywhere, or the output from any of your systems (ERP, CRM) without changing existing processes and your mail will still be delivered by Royal Mail. "The way we use mail and delivery services is changing, from traditional letters to hybrid and digital secure services, we are adapting to deliver the communication of the future." no ink or toner cost and savings of over 35% on postage.